On a small inlet only five hundred metres from the coast, Lam Van Nhien points towards a hedge of mangroves. He explains they form a natural barrier, offering at least some protection against sea water that can enter his shrimp pond. Nhien lives on about 0.5 hectares in Bao Thuan commune with his wife Thai Ngoc Diem. In their pond they raise freshwater shrimp, crab and catfish. They also grow watermelons in the sandy soil. The couple have two children who live with their grandparents at this time of year, when not even a cloudlet forms in the sky. We visit under a thatched roof in the morning, drinking tea together. The Chairman of the commune is there, along with an officer from the Adaptation in the Mekong Delta (AMD) project. They tell us a familiar story. During the rainy months, sea levels rise and bridge the narrow stretch of land separating us from the beach. 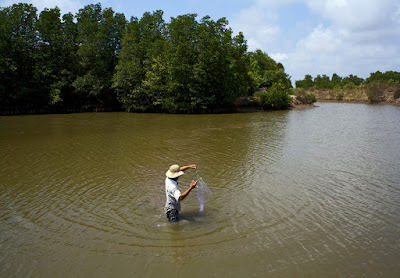 If too much sea water enters their pond it can wipe out all of the aquaculture. The government has tried to help by constructing a sea dyke and planting rows of pine trees as the last lines of defence. Nhien brings us out to the beach to show us. What we see are overturned trees lying in the surf, their gnarled roots ripped from the ground due to coastal erosion. During the dry season, the situation is just as precarious. This is what we witness first-hand. There isn’t enough water for Nhien and Diem’s household consumption or to irrigate the watermelons. Scarcity impinges on their daily existence, and they’re forced to conserve wherever they can. In the afternoon, Diem demonstrates how she tends to the watermelon field. The plants are covered to retain moisture, and she only waters them at the roots. Each day she labours under the intense sun, trimming away at excess stems so that eventually the fruit will grow ripe. Every two days a boat arrives to the property via a canal and fills two concrete cisterns with freshwater. This is what they depend on to get them through the times of greatest scarcity. Diem says that prices for water in Bao Thuan commune are more than ten times what they are in urban areas. To face some of these challenges, the AMD project is investing in pro-poor adaptation investments throughout Ben Tre and Tra Vinh provinces, where there are many similarly affected coastal communities. The project offers interventions such as building salinity barriers and other small infrastructure to safeguard farmers’ fields and aquaculture ponds, promotes salinity monitoring and forecasting to ensure farmers have reliable information on the salinity content of their waterways; and will provide best management practices so that farmers can better protect shrimp larvae, giving their crop the best chance for success. The issue of water stress is one of the most critical in this context. Here the project will work to upgrade canal systems for improved water storage, and engender rainwater collection and water-saving irrigation techniques. The household we visited displayed a real demand for the types of adaptation investments supported by IFAD. Their situation made clear that relying wholly on expensive sea dykes is not enough to protect production, and that more pragmatic approaches can help improve farmers’ knowledge and practices. There are encouraging signs that the AMD project will be effective in this role, when it soon begins its work in earnest. My hope is that small farmers on Vietnam’s sea border will be able to benefit from much needed investment before sea level rise causes more economic loss and displacement.